On Energomashspetsstal there was a presentation and rewarding of the best works taking part in the contest for the best proposal for increasing energy efficiency within the framework of the contest “Energy Saving!”. This year 10 people competed for the victory in the contest. Previously, the expert commission considered the participants’ projects. The proposals were evaluated on several criteria: novelty, applicability for PJSC “Energomashspetsstal” and economic feasibility. According to the results of the jury’s voting, four winners were chosen. 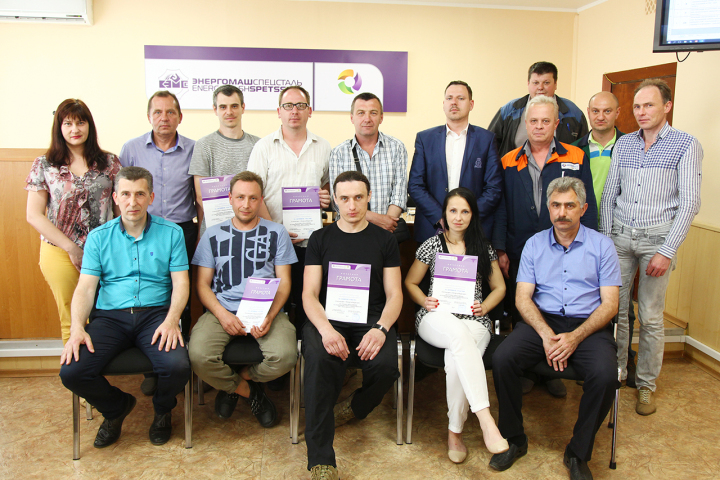 The best energy conservation project the tender commission recognized the offer of Alexander Mulyar, an electrician of electrical equipment maintenance of Equipment Service Shop. Alexander Mulyar has won prizes few years. This time, his project “Electricity saving on the forging complex of automated forging complex 6000 ton-force” will save the enterprise 113 880 kWh per year, which in money terms will amount to UAH 121,800. In the near future this project will be implemented on the automated forging complex 6000 ton-force. Alexander Tarasenko the Head of Foundry Shop molding area took the second place in the contest “Energy Saving!”. His proposal “Saving energy by producing a liner drw. M 3402-00-001 for Electric Arc Furnace Shop in another way “has already been implemented. Due to Tarasenko project, Foundry Shop managed to reduce the consumption of molding mixtures for the production of one liner by 10 tons, and, consequently, to reduce the consumption of energy carriers for its preparation. With an annual program of 12 liners, the economic effect was 7600 UAH. On the third place is the project of Vladimir Kononenko the leading maintenance engineer of Chief Metrologist Department. His proposal “Modernization of the temperature mode alarm of automated forging complex -70” led to the time reduction of furnace downtime, which accordingly reduced the cost and quantity of electricity. The fourth winner of the contest was Vladimir Tsapko the power engineer of the shop “Ukrmegastroy” with the proposal “Saving energy by excluding the work of heating appliances (hot water supply and boiler room) in the hours of morning and evening peaks in Power Shop on the heat-power area.” Due to the implementation of this proposal, the economic effect for the heating season has already reached 49,900 UAH. For the initiative in the contest “Energy Saving!” The authors of all proposals were encouraged by certificate of appreciation. Winners received diplomas and money reward.